"I did some soul searching and discovered it was both the anti-Nazi sentiment and the sexiness that really seemed to get to my core." Two-time, FringeNYC award-winning writer/performer Cyndi Freeman's latest solo show traces her journey from a little suburban Jewish girl obsessed with Wonder Woman to a fabulous burlesque Queen in NYC. As a kid I was just always reenacting TV shows with my friends and staging little plays for my poor parents. When asked at age 5 what I wanted to be when I grew up I said, "a movie star". As I got older, I realized "Movie Star" is not what it's cracked up to be - that the bug I always had was in creating my own shows. So I am still doing what I was doing when I was 5 - just for a larger audience. 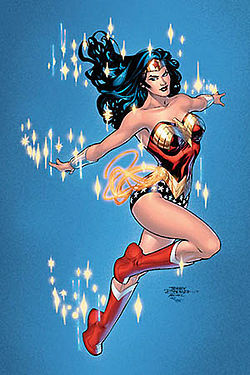 I became obsessed with Wonder Woman when I was 12. Although I have "grown up", I am still influenced by the icon. So many of my choices are connected to my love of Wonder Woman and what she symbolizes. The show weaves personal stories of discovery and empowerment with trivia about America's favorite female superhero. 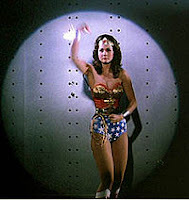 For my 40th Birthday, I bought myself the DVD of Wonder Woman, Season 1, just for fun. I started the pilot on my computer, expecting to find it too childish for my adult sensibility, but as I watched it, I found that chills went up my spine. It was the same feeling I had when I was 12 watching the show -like a giant hug. I did some soul searching and discovered it was both the anti-Nazi sentiment and the sexiness that really seemed to get to my core. I decided there would be a great show in this when I started looking into who created her, William Marston. From there I became even more inspired to move forward with it. Wonder Woman has an amazing history. The show has been slowly coming together for 7 years. What was the development process of the material from inspiration to stage to this stage? I am a storyteller in NYC and have a show of my own that I co-produce with my husband, Brad Lawrence. 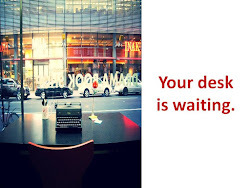 It is the perfect place to try out new ideas. All my stories were worked out before an audience. Meanwhile, I worked with my director, David Drake, on shaping and structuring the show, choosing which stories were best for the show and coming up with the perfect words. He is a very, very funny man and many of my best one-liners came from him. How did you find your director? Through a mutual friend, theater producer Paul Lucas, who was a doll and helped me find not just a director but a photographer who came to a rough draft staging and gave notes. As for David Drake, I am so lucky to have worked with him. This is a one-woman show but not a one-woman effort by any means. David really helped me find the core themes that I was working with. The stuff hidden in my subconscious that I would not have been aware of without his keen eye. He is also just a lovely guy and a lot of fun. Alas, he is out of town at the moment. In the meantime, I am receiving additional coaching on the show from Peter Aguero, who is one of the best storytellers in NY. Stories from the heart. I love "This American Life", "The Moth", and I read memoirs. I also have a love of camp and over the top bad books and movies, so I have a huge collection of pulp fiction with crazy covers that I read for kicks. I am also fascinated with cryptozoology. My current read is a book entitled "The Great Sea Serpent of New England." And I also love burlesque performers- the scene in NY is so creative and fun. My favorite TV show is Dr Who. I go through phases where I am prolific and then I am dry. I had a teacher once tell me that part of the creative process is "listening" so I guess I have my "listening phase" and then my "saying something phase." What do you do when you get a block? I make myself go into listening mode. I cruise the Internet for what ever might interest me. For example, I knew very little about Napoleon. So one day I started at Wikipedia, went next to a documentary from PBS and discovered that, during his final exile on the island of St. Helena, he met a 13 year old girl, Besty Balcombe, who became a very special friend. She wrote a memoir about her time as his pal with the long title Recollections of Napoleon During His First Three Years of His Captivity on the Island of St. Helena. Published in 1844, the book has a similar style to Little House on the Prairie but it stars Napoleon. Boy, did this get my mind moving in new directions! It is available for free at Archive.org. What shows/performers are you excited about right now? See the above shows and take Wonder Woman on the road to festivals in the US and Canada. 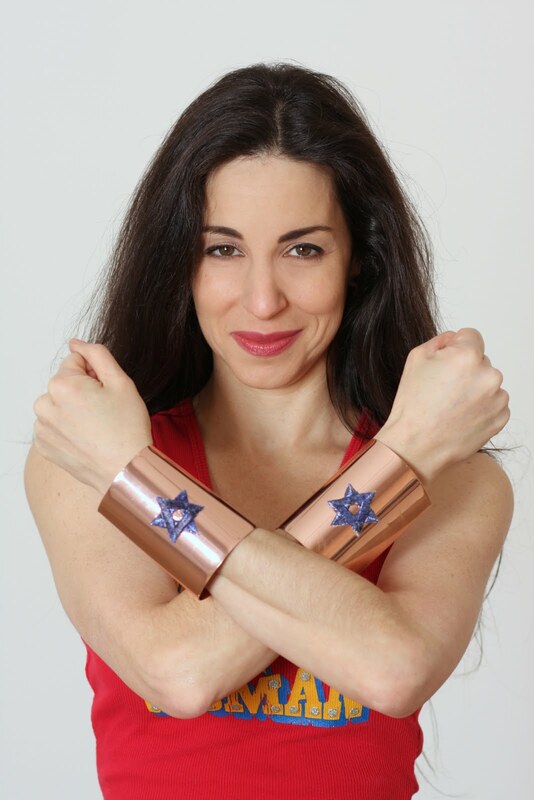 Wonder Woman: A How to Guide for Little Jewish Girls is playing 2 shows Oct 4 & 6 at Stage Left Studios in NYC, part of their Women At Work Festival. You can lasso some tix here.